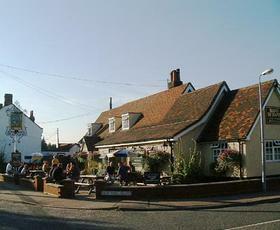 Large pub with a separate restaurant area. Three ales available: Adnams Bitter, Old Speckled Hen and Woodforde's Wherry. The last one was well kept and reasonably priced. Standard pub food offering available at very fair prices. The food we had was very good. Worth visiting in an area short of decent pubs. Although this is a perfectly fine pub, I think that the other review is misleading. We went here mainly for the food, but it was disappointing: everything hot was microwaved (except a rather tough steak) and the salad garnishes were very tired. However, the service was friendly and the ambience pleasant. The restaurant was empty apart from us on a Saturday evening. It was September 2006 when Sheryl and Mark arrived at the Hand In Hand. Sheryl's cooking soon became the talk of the village, and no wonder as the food is great. Becides the bar menu the specials board is constantly changing and I have to say it is the only pub I have been to which has has Monkfish on the specials board. There is a resteraunt, or you can eat in one of the lounges or on the terrace. The pub itself is 3 converted cottages plus an extension which keeps in with the character. To the front there is a terrace which overlooks the feilds towards the river Orwell. Some great walking around the village of Trimley St. Martin, which the Hand in Hand caters for. One end of the bar allows walkers in however muddy their boots are. This end of the bar also allows dogs in, so dog walkers are not left our either. The selection of beers is much as you would find in most establishments, however there is a small selection of ales, which is my personal choice.